Late last year, Financial Services Authority chief Hector Sants met with the Occupy London protesters. Sants promised to 'listen carefully to those areas where they would like to see change'. This event epitomised the way companies are renegotiating with society its licence to operate. In this volatile environment, the kind of Thought Leadership exhibited by Sants is essential. But how is this achieved in practice? How can you become seen as a leader in your field, and command respect from your stakeholders? We've teamed up with Thought Leadership specialist agency TLG to bring you some answers. In this supplement you'll find plenty of inspiration for refining your organisation's corporate reputation. Find out how Innocent Drinks and Kingfisher have motivated their staff into becoming their primary reputational asset, and hear from executive search expert Dominic Schofield about the kind of characteristics the 21st century reputation manager needs. 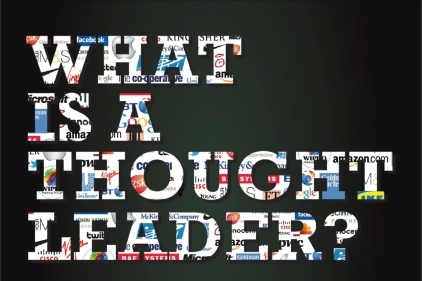 What is Thought Leadership and is it key to a strong corporate reputation? The authors reveal their views, either from the position of an informed observer, such as the FT's Ravi Mattu, writing about Apple; practitioners, such as serial entrepreneur Luke Johnson; or, from a corporate perspective, such as Nick Folland of Kingfisher discussing leadership on sustainability. TLG reveals the results of the fifth TLG Index of Thought Leaders (UK). This offers insights into corporate reputation and the factors that drive it. The index reveals the strongest brands and why they are strong, and TLG advises what weaker brands should do to build their reputation. TLG is pioneering a new approach to corporate reputation: Thought Leadership. We've turned an ill-defined concept into a quantifiable campaign tool. The benefits of being a Thought Leader are demonstrably positive; the most successful enjoy the status as a 'most trusted' brand.